More of everything you want in a scrub set. Classic v-top, unisex fit, is cut for comfort with two roomy patch pockets and side vents. Drawstring pants, unisex fit, with back hip pockets are neither baggy nor tight and the string is substantial enough to hold its tie without slipping loose or knotting up. Set wears comfortably tucked in or left loose. Center back length: 28½". Regular inseam: 31". Our classic unisex v-neck tunic is cut for comfort and its sturdy construction allows for greater wearability. 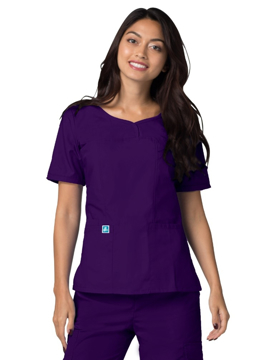 Tunic features two roomy patch pockets, one inner cellphone pocket on the right wearers and side vents. Center back length: 28½". Our classic unisex v-neck tunic is cut for comfort and its sturdy construction allows for greater wearability. Tunic features side vents and one left chest pocket with pen divider. Center back length: 28½". Our classic unisex v-neck tunic is cut for comfort and its sturdy construction allows for great wearability. Tunic features two extra roomy patch pockets, one left chest pocket with pen divider and side vents. Center back length: 28½". Double patch pockets are the focal point of this pretty, short sleeve top. The stitching along its v-neckline and snap-closure front ensure a garment that sits nicely and always looks neat. Center back length: 27½". The eyelet cutouts in a daisy motif really draw attention to the floral embellishments along the v-neckline and along the bottom. Two large patch pockets in the front make this top both stylish and extremely functional. There are also side vents for ease of movement and a comfortable fit. Center back length: 26½". The piping on this figure flattering top runs along the v-neckline and crosses over the front giving it the look of a pretty wrap with the comfort of a simple v-tunic. Two patch angled pockets and inside pocket on the right side, side vents, and a drawstring in the back creates a shapely fit. Center back length: 27". Stay protected while showing off your personal style - this double princess consultation coat offers a v-neckline to keep you covered without hiding your favorite blouse. 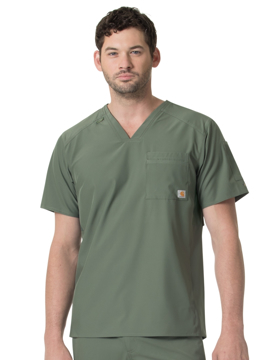 Two roomy patch pockets and a chest welt pocket offer premium utility without sacrificing style. Center back length: 31". Classic fit easy-to-wear top features self-trimmed crossover sweetheart v-neckline with curved empire cut yoke and shapely princess seams. Above elbow sleeves with notched turn back cuffs, two patch pockets, cell phone pocket, center back elastic and side vents create a neat, no-fuss look. Center back length: 26½. 3-pocket zip v-neck splice back block perforated knit raglan high low top. Modern fit. Moisture-wicking. Odor control. 4-way stretch. Chafe-free. Seamless. Center back length: 26½". 4-pocket v-neck with raglan sleeve details, hidden pocket and chest pocket has a secure zip media pocket. Center back length: 30". 5-pocket shaped v-neck with sporty contrast, perforated panels front and back. Modern fit. Revolutionary temperature-regulating fabric technology adapts to environmental and body temperature variances, providing optimal comfort. Center back length: 25½". 5-pocket shaped v-neck with sporty seaming, perforated panels front and back. Center back length: 25½". This v-neck top features a locker loop at back neck, triple-needle stitching at shoulder seams, ear bud holder, double pocket at sleeve, pen holder, inner cellphone pocket, logo D-ring at double pocket, and four front lower pockets. Center back length: 27¾". FastDry technology wicks away sweat for comfort. Stain Breaker technology releases stains. Rugged Flex stretch technology for ease of movement. V-Neckline with forward shoulder triple-needle detailing underarm for breathability. Sleeve pocket. Back yoke and inner back mesh venting. Longer back length. Tagless label. Embroidery friendly. 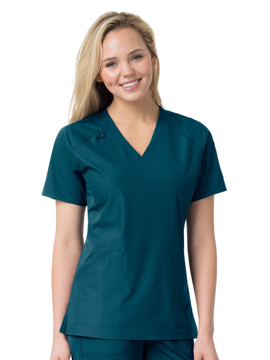 Center back length: 31"
This color block v-neck top features a tradesman pocket at chest, bi-swing at back yoke for ease of movement, back length is 1½" longer than the front for added coverage, and tagless label at inner back yoke. Center back length: 30¾".